Audiences have traded in ascots and ball gowns for ripped jeans and t-shirts at the theater. But creating a stylish ensemble for a night on the town should not be intimidating. 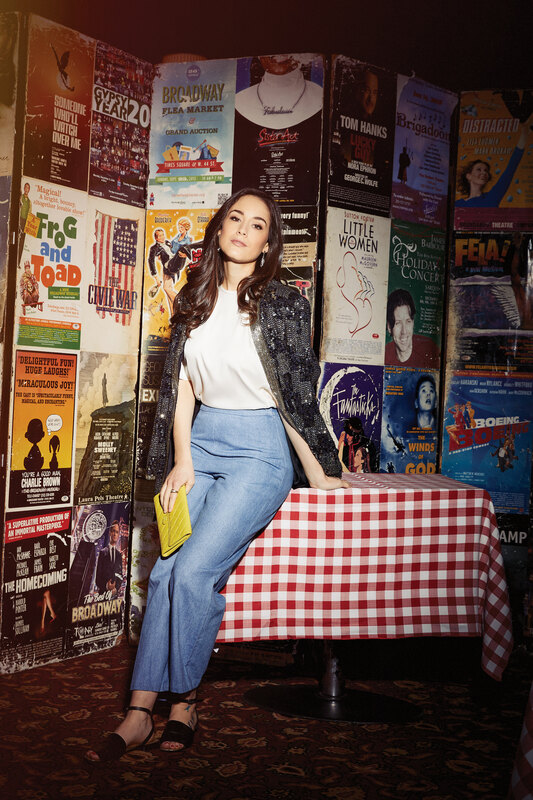 Lauren Ridloff (“Children of a Lesser God”) and Jelani Alladin (“Frozen”) showcase evening looks with pattern-mixing and sleek silhouettes, while Alison Luff (“Escape to Margaritaville”) and John Riddle (“Frozen”) model afternoon outfits with wide-leg trousers and floral prints. Here’s some inspiration for your next night (or day) at a show. Don’t be fooled: This matching top and skirt is a great update to a dress. The “Children of a Lesser God” star makes a statement by mixing patterns, but make sure you coordinate with your pieces with complementary details. The black floral pattern in the blazer works in tandem with the top and skirt’s black and white design. Mixing black and blue is no longer taboo. The “Frozen” star looks dapper onstage as the ice monger Kristoff in the Disney hit and offstage in this blazer and slacks combo, with a subtle floral shirt. Florals can be evening-appropriate, just make sure to pair with dark colors. The cropped, cuffed trouser is a great alternative to a dress pant, and by cuffing the pant legs, you can show off a Chelsea boot. The “Escape to Margaritaville” star may don resort wear onstage, but here, she shows the perfect way to sport jeans to the theater. The wide-leg, cropped pant is a great way to elevate denim, and by keeping the top and shoes simple, you can really showcase your statement pieces. Also, don’t be afraid to mix metals! The “Frozen” star may wear royal threads as Prince Hans, but he also knows how to dress casual for the theater. A knit blazer is a comfortable way to polish off your look, and the light floral pattern is perfect for spring. Don’t be afraid of a colorful pant and shoe combo, and opt for a lapel pin instead of a pocket square to keep things interesting.